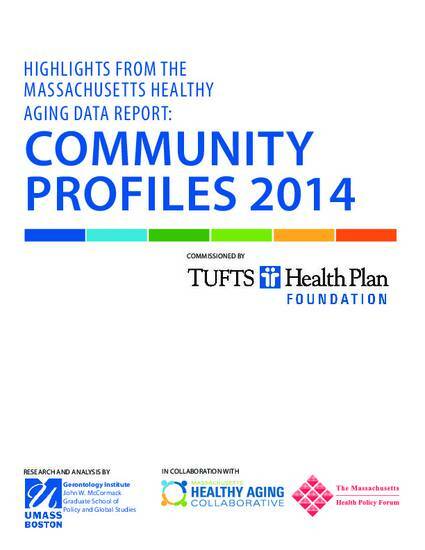 The Massachusetts Healthy Aging Data Report: Community Profiles was created by researchers at the Gerontology Institute of the John W. McCormack Graduate School of Policy and Global Studies at the University of Massachusetts Boston and commissioned by the Tufts Health Plan Foundation. In this report, we have created a custom profile of nearly 100 healthy aging indicators for every city and town in Massachusetts including the 16 neighborhoods of Boston (367 Community Profiles). Each Community Profile is designed to help community residents, agencies, providers, and governments understand the older adults who live in their cities and towns – their ages, living arrangements, health status, strengths, and vulnerabilities. Never before has Massachusetts had such a comprehensive view of healthy aging indicators reported at this local geographic level. Commissioned by the Tufts Health Plan Foundation.